#6 "Dark Age Skarrd Abomination, Dust Tactics Scenarios, Zombicide Scenarios"
Ravage Magazine US Issue number 6 is the first issue of their great miniature gaming magazine to hit shelves in 2013, and with each new issue they raise their bar! They have been doing everything they can to make each issue superior to the last, and they think it has shown in their product. The Ravage staff has always gone to great lengths to pack it full with useful gaming information and hobby skills from the corners of the industry, and this issue is a great example of that. Each issue of Ravage US allows them a chance to help create stronger links between the cogs within the machine that is the miniature game industry. They publish it to give the game publishers and artistes around the world a place where they can share their ideas and skills with readers everywhere. 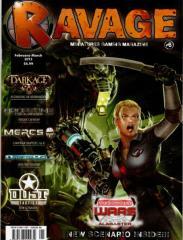 Ravage magazine offers information from sources that some readers may not otherwise get the chance to lay eyes upon. This is what their magazine means to the industry as a whole – creating a haven where all miniature games, gamers and designers can come together to make gaming everywhere stronger and better. Ravage US #6 is chock full of great articles and new materials. From its glossy pages filled with striking art and useful articles, to the assortment of brand new games and artistes joining our growing stable of sources. Not only does this issue contain new scenarios from DUST Tactics, Sedition Wars and Zombicide, a great step-by-step process on how to assemble and paint the massive Skarrd Abomination for Dark Age, reviews of new games and products headed to stores, a how-to article on building some post-apocalyptic terrain, and even a review of the new Forgeworld book for Warhammer 40,000 6th Edition –Horus Heresy Book One: Betrayal.